Distinguishing Characteristics African-American female. Black hair, brown eyes. Cochran has pierced ears. She may wear eyeglasses. 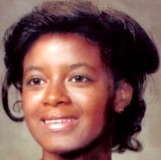 Cochran was last seen in Pell City, Alabama on July 11, 1992. She asked her daughter if she wanted to the beauty parlor with her, and her daughter said no, so Cochran went alone. She left her mother's home at approximately 6:00 p.m., driving a gray 1987 Nissan Sentra, possibly en route to Birmingham. She has never been heard from again. Her vehicle was discovered abandoned and burned on an isolated road in Talladega County, Alabama less than twelve hours later. Cochran was estranged from her husband at the time of her disappearance. She has three children. Her case remains unsolved. Updated 3 times since October 12, 2004. Last updated June 15, 2012; picture added, details of disappearance updated.